The 80’s CBS cop drama Cagney & Lacey, is currently being rebooted. The pilot stars have been cast. The original series followed two lady detectives as they solved crimes in New York. It’s also where Martin Kove, from prior BW Video Review Hard Time On Planet Earth came from. The original series went through three different actresses playing officer Christine Cagney, Loretta Switt in the pilot and Meg Foster in early episodes, before casting the more well known portrayer, Sharon Gless. Her partner, Tyne Daly, was always Mary Beth Lacey, and went on to a co-starring role in the series Judging Amy as the mother of the title character, a Connecticut judge. (I only saw one episode). The show ran for seven seasons and four TV movies. Will the new series share that success? We’ll have to see what happens with the pilot first, won’t we? Posted by ShadowWing Tronix on March 15, 2018 in Television Spotlight and tagged Cagney & Lacey, reboot. 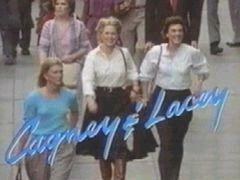 I recall my mother watching a few episodes of Cagney and Lacey when I was a kid, but I don’t remember much about it. I’m neutral on the show myself. At that time in the 80s, it was quite a novelty to see women police officers on television (and even in real life). Since Cagney and Lacey went off the air, women have been portrayed in many police shows as capable police officers, detectives, police chiefs, etc. Law and Order SVU comes to mind as a show that does an excellent job portraying females in police work. Plus, there’s the fact that in 21st century America, women play a major role in police forces now. This is no longer the 1970s when sexist old timers on a police force would make life difficult for new female police officers. So a 21st century Cagney and Lacey wouldn’t have the same feel as the 80s one because now women have broken down so many barriers in police work. In the 1980s, women will start striving hard to become accepted as police officers in police departments where sexism ran rampant. It could still be good. I saw a few episodes of Rizzoli & Isles on TNT because my mom liked it and it was good. Yes, this new Cagney and Lacey could be great. It will have a different tone because women have made many gains in the law enforcement career field since the 1980s. That’s something to celebrate. Hey, a new Roseanne show is coming out soon too and it’s also updated for the 21st century.